Okay, you waited patiently for this, and a few of you kept poking me to make sure it got done. I hope I made you proud! Part 1 gave a brief overview of each talent. 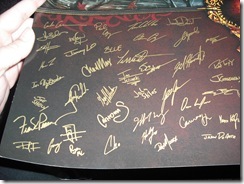 Part 2 went through my Holy spec, and how you can customize it for your needs. 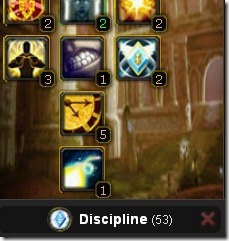 This installment will review my Discipline spec, which is NOT a cookie-cutter build. *PvEers: If you are 100% certain that another Priest in your raid will have Imp:Fort, and not mind buffing, and you REALLY feel the need for threat reduction, you can move these two points into Silent Resolve. I don’t think it’s worth it, but it is an option. **PvPers: Choose Martyrdom rather than Imp:Fort. Because this is a Disc build, and Disc builds focus on single target or tank healing, after plugging in the mandatory points in the Disc tree, we should flip over to Holy, since we KNOW that we will want Inspiration, and get those points out of the way. This will give a better idea of how many points we have to work with when we are making either-or decisions deep in the Disc tree itself. 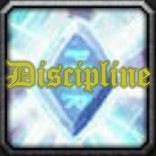 The first step is to max out Holy Specialization – I do this in Holy to allow more Haste on my gear, but in Discipline because of how Crit is heavily favored by deeper Discipline talents. Next, because I personally use Renew rather heavily to even out spiking tank damage, I max out Improved Renew. I do not use Greater Heal often, so I only put 2 points in Divine Fury for now – I prefer that my Greater Heals be slightly faster when I DO need them (and, remember, I’m very used to a LOT of haste – I generally have over 15%). I have considered removing these points from Divine Fury altogether and moving them into Healing Focus – But, again, because this build is specifically for General Vezax, none of the damage causes spell pushback. You could make a case for putting these points into Spell Warding, but because of how Saronite Vapors works, as you decrease your taken damage, you will also decrease your mana received. (Note: Saronite Vapors are only available on regular mode) If you have trouble getting out of the vapors before the 8th tick, or want some cushion for the 7th, 2 points in Spell Warding might be a great idea. Whether you decide to put these points into Healing Focus, Divine Fury, or Spell Warding, leave it at two – that’s all you need to get to the next tier. If you find yourself with extra points after we’re done on the Disc side, you can always come back and plug them in. Getting to the next tier is critical, since that’s where Inspiration is. Max it out, and go back to the Disc tree. So far, with the exception of limiting the points in Divine Fury to two, this looks exactly like a Holy build. Which makes it time to plug points in down the Disc tree. We already took the Mandatory 14 points in Step 1, so we’ll move forward from the 3rd tier. We already maxed out Meditation and Inner Focus, so just pick up all 3 points in Improved Power Word: Shield – the bread & butter spell of a Disc Priest – now even better! In the 4th tier, 3 points in Mental Agility is all you need to move on to the 5th tier. Many, many Priests who take Disc as a career option will also want to pick up Absolution – invaluable on fights that involve crazy amounts of dispelling like Hodir Hardmode, Thorim Hardmode, and Yogg Saron. Because my disc build is for General Vezax specifically, and Vezax involves zero dispelling, I skip it. 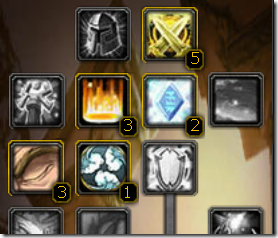 You do not, for any reason, need Improved Mana Burn in a PvE build. Tier 7 allows you to skip Focused will – the increased crit chance notwithstanding, this is primarily a PvP talent, and the bulk of it is useless for PvE. Power Infusion, on the other hand, is a brilliant talent. I don’t use it on myself on Vezax HM, since the mana cost isn’t offset by my own casts (I’m not chain casting. ), but I’ll toss it on a Mage or Ele Shaman if I have spare mana. Having this talent allows my very specialized spec to do double duty in 10 mans. I do max out Improved Flash Heal – especially now that they cooldown on Penance is longer, I find I sometimes need Flash Heals to top off the tank. 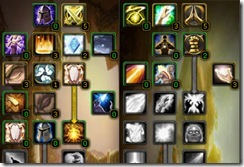 Tier 8 gives us one of the greatest talents in the Disc Priest arsenal – Renewed Hope. I had a Disc Priest try to tell me that PW:S wasn’t worth the mana on Vezax – that it didn’t absorb enough. (I know, right?) Even if it didn’t, the increased crit to Penance, Flash, and Greater Heal, and the chance to reduce damage on this tank by 3% is unbelievable. Rapture is where my spec gets a little strange. I only take 2 points here. 1 of them is to open the next tier, and the other could be moved somewhere else. The thing is that Rapture, while amazing on fights that actually allow regen, doesn’t work on Vezax. I’ve heard conflicting reports that it DOES work on your target, but not you, the caster. 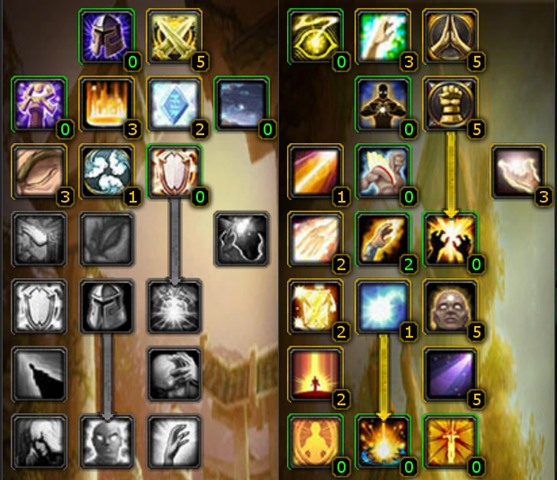 Either way, my tank is far, far, far from rage /runic power starved, and if I can’t get any mana back, who cares. I’ll show you what I do with the extra point later. Aspiration is useful for lowering the cooldown not only of Penance, but of Inner Focus. Max max max. Max out the whole of Tiers 9, 10, and 11. Not that you need specific reasons, but on tank-damage-heavy fights like Vezax, an additional shield, external, tank-saving cooldown, and additional healing received are HUGE. Ditto for a 40%-of-your-spellpower-bigger PW:S, spellhaste, and the grandaddy Disc Healing spell of them all, Penance. Nom, Nom, Nom. Okay, so you can see that we now have 53 points in Disc, and if you’ve been following along in the holy tree, you’ll have 13 spent there. This leaves 5 points. Go over to the Holy Tree. In the middle of tier 4 is Improved Healing, which reduces the mana cost of Greater Heal, Divine Hymn, Penance, and some junk we don’t care about. For a fight like Vezax, this is huge. To get there, I take Desperate Prayer, mostly because I’m so used to having it (and bad things seem to happen to me when I don’t.) and I add one more point into Divine Fury. Again, these are purely based on my personal playstyle, and you could pack those two points into Healing Focus or Spell Warding – I just haven’t found either of those talents as useful as extra haste for my biggest heal, and an “Oh Sh**! !” button for myself. Once those points are assigned, traipse down to Improved Healing and max it out – this reduces the mana cost of your Penance by 15% – roughly 93 mana saved, per cast. THIS is why I shaved the point out of Rapture, and why my Disc spec is considered pretty unorthodox. I wouldn’t spec this way if Disc were my primary spec, but for Vezax, Vezax HM, and any 10 man content (where my gear can compensate for a non-ideal spec), it’s brilliant. Which, again, is very, very specialized, and not at all what I would call a “typical” Disc spec. Part of my hesitation in writing this post is that I know most of our commenters and community are very vigilant about watching for things to be “best” and also about making a very strong case for their own quirks – but that’s the thing about WoW as it stands currently – “best” is dependent upon playstyle, which is itself dependent upon available content/equipment. That said, sometimes there really IS a “better” if not a “best” way to do something, and the fastest way to figure out what that is is to throw yourself into the lovely group of people that make the healer community. I hope this look at a non-standard build helps you feel more comfortable stepping outside the box and tailoring your own spec to your specific needs – feel free to discuss what you’ve found helpful in the comments. Matticus is still finishing up his epic vacation in lovely southern California, and so you’re stuck with me providing as much content as I possibly can for the next couple of days! Meanwhile, the thing on the top of my mind is still Blizzcon, and more specifically Cataclysm. I’m sure you’ve already read all about my adventures, but if you have more specific questions, either about the con in general, or the xpac specifically, I’d love to answer them as best I can. To that end, this post is an Open Thread – you ask your questions; I’ll answer them! Talk to you soon! 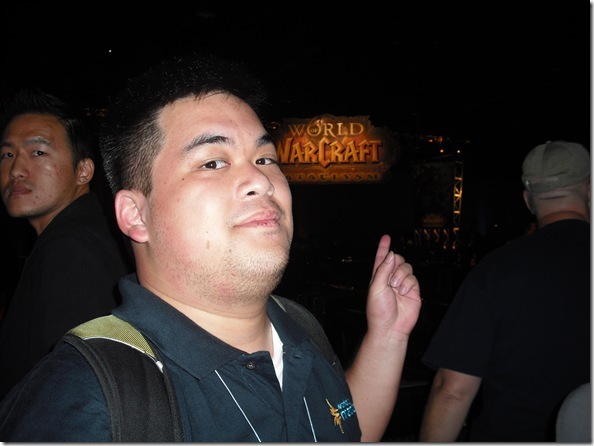 Here’s the thing about an event like Blizzcon – there is SO MUCH going on that it overwhelms your senses and strips you of your faculties. You may have all the best intentions of blogging about every little detail, but what you end up coming away with is a jumble of emotions mixed with images…. and ringing in your ears if you stayed for Ozzy. 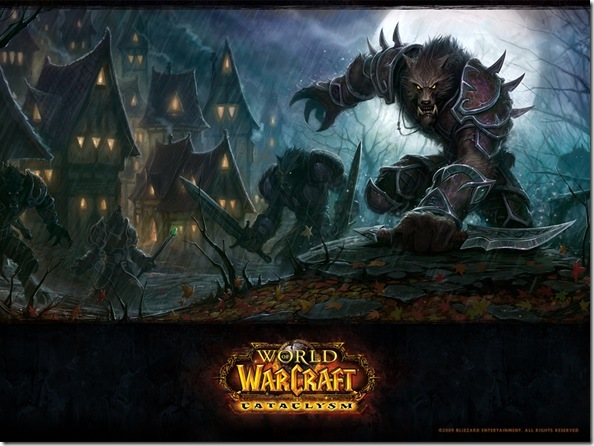 If you want coverage of Cataclysm, specific panels, or any other information, you can find the info on the official site, WoW.com, and even You Tube. If you want to hear about this Troll’s experience, keep reading! So getting up the next morning was tricky, but we still hauled our buns to the convention center by 10am. Why? I think I mentioned that my boyfriend is a huge Starcraft fan. We got there to see the final rounds of the RTS tournaments. I have to say, I never really understood why these games were so popular, even 10 years after their release…. but now, I know. These matches were like chess, but with more pieces, better graphics, no taking turns, and now a room full of spectators. Every great play was greeted with cheers, and every killing blow with applause and whistles. The sheer speed of the players was like nothing I’d ever seen – spending less than a second on each view of the screen, just enough to click on their troops and direct them, then zoom back to another critical area of the map. The video archive will be up soon on Blizzard’s site, and I highly recommend taking a look at it. After yesterday’s issues getting back to the con from lunch, we decided to eat in the center that day – which wasn’t a bad idea at all. The food was quite good, and since prices already included the Anaheim area’s 9% tax, not much more expensive than what you’d find in the area. 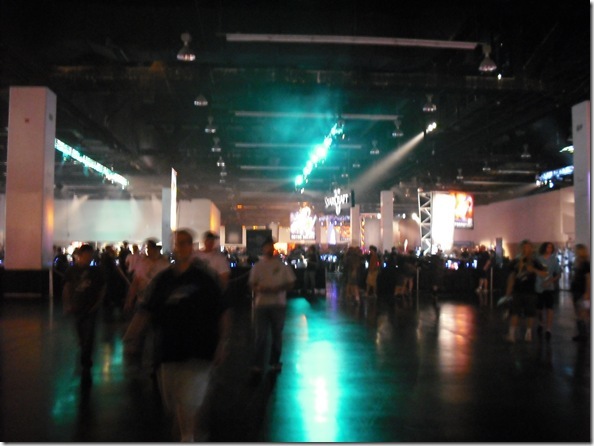 I don’t think I can say enough that the venue was perfect for Blizzcon. Most conventions sell nasty pizza and soggy french fries. I had a portabella mushroom wrap and a brownie. There was fresh fruit everywhere, and surprising things like frozen yogurt, candy apples, grilled-outside hamburgers, and chickpea salads. Seriously, next year, I don’t think I’ll bother to leave the center at all. 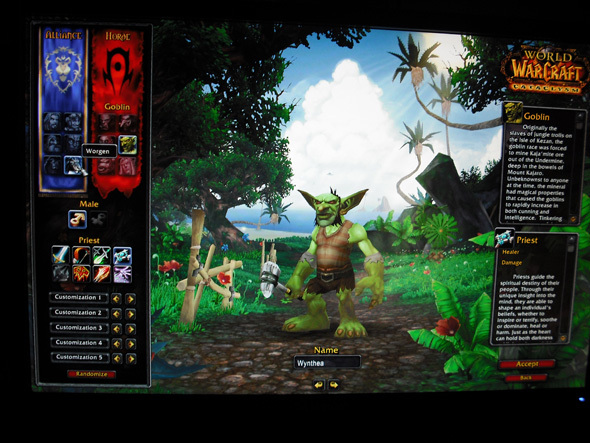 In between match-ups, the screens broadcast all the WoW panels I was interested in seeing – from better seats. The timing of the panels was well orchestrated, and used as entertainment for crowds that might be waiting in line for demos, or, like we were, for the tournaments to start. I’ll sum up my thoughts on all the news about Cataclsym later. 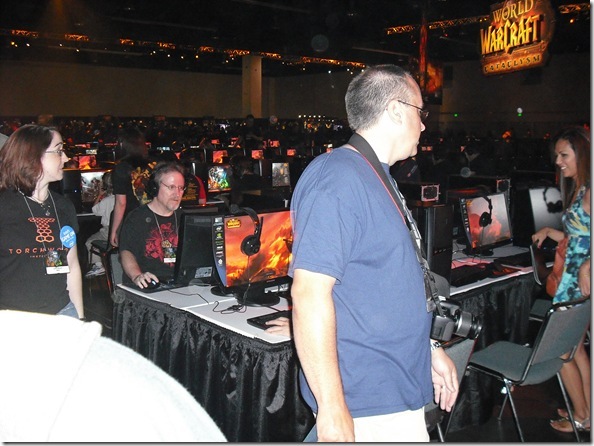 After the tournaments, we meandered around the con, visiting vendor booths and exhibits we’d skipped the day before. My GM called to let me know that they’d saved seats for us in the main stage area, and we headed over for the closing ceremony. The first band that played was Blizzard’s in-house metal band, Level 80 Elite Tauren Chieftan. Say what you want about them, the idea that a bunch of video game nerds get a chance to live out their rockstar fantasies is pretty awesome. I know I’d do it if I could. I’d heard mixed reviews beforehand, but was pleasantly surprised by their live performance – who knew Mike Morhaime, Blizzard CEO, could rock a bass like that? Lead vocals are provided by Samwise Didier – the same guy whose face appears when there’s no default icon for a spell in WoW. But all of this was just a prelude to the obvious headliner – Ozzy “The Prince of Darkness” Osbourne. Confessional: I enjoy good music no matter the genre, so Black Sabbath and Ozzy have made their way into my iPod – although when I listen to metal it’s usually more along the lines of Theatre of Tragedy or Finntroll. That said, I was skeptical about Ozzy’s ability to perform. We’ve all watched him age, and witnessed the effects of a Rockstar lifestyle. I wondered would he be worth the hype live? Ozzy gave, hands down, one of the best live performances I’ve ever seen. The only thing is that to keep the audio levels appropriate so that those watching the DirectTV stream could hear the band, you can’t quite hear the crowd. Several of my guildies even asked me why the audience didn’t seem too enthusiastic….. on the contrary, it’s Tuesday, and my voice still isn’t back from the Saturday night concert. 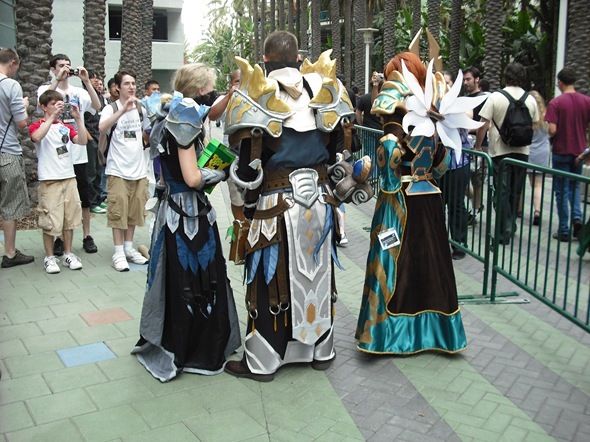 Apparently, it was also the first instance of crowd surfing at a Blizzcon. We followed up the concert with a last dinner with the whole guild together, and that was it. Blizzcon was over. Only spanning two days, we felt like we’d been there for at least four – the days so long and packed with a million unique experiences. The thing I’m most certain of is that I cannot WAIT to go again next year! I’ll wrap this up soon with my thoughts on Cataclysm and the future of WoW. We returned from lunch, too late to grab seats for the panels, but with plenty of time to get in a quick game of Starcraft II before the costume contest. 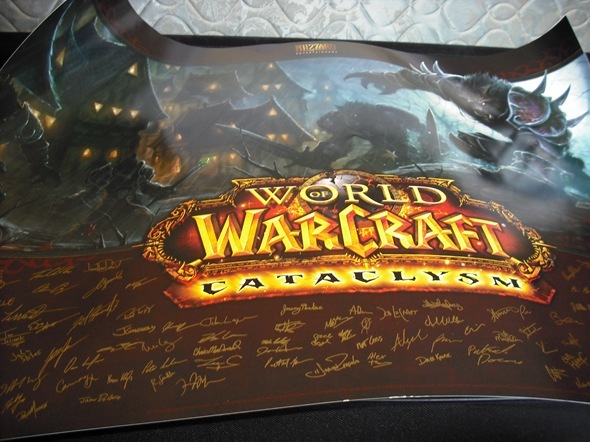 Not being a Starcraft player, I checked out the line for Cataclysm, to see if I could take a second crack at it, and maybe play Goblin (okay, I’m lying, I just wanted to play more Worgen) but the line was insane, so I just wandered over to an un-crowded spot and sat on a table. Suddenly, it got very, very cold, and I heard a sinister voice whisper in my ear “How are you enjoying Blizzcon?” I turned around, and before me stood The Lich King Arthas himself, staring intently at my very soul. 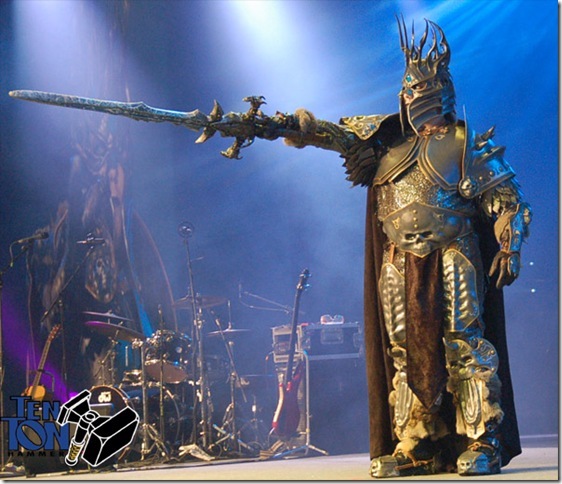 Okay, that might be a bit of exaggeration, but I did quite suddenly find myself having a conversation with Rob, the Rockstar Con-goer cosplaying Arthas. At least, we were trying to have a conversation, but were interrupted every 30 seconds by people who, quite understandably, wanted to take his photo. In between camera flashes, he revealed his terrible secret – when you’re in a costume, you can’t possibly go stand in line for a drink, and maille gauntlets make it tricky to get your wallet out of your pocket! 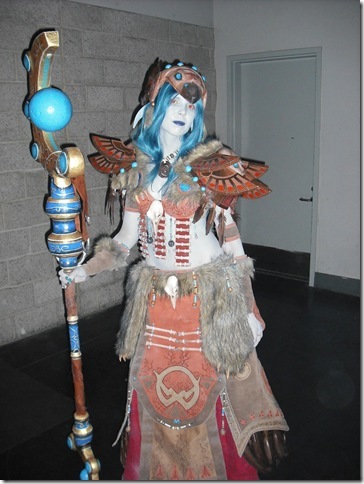 That’s right, I, Wynthea, entered into the service of the Lich King. I managed his wallet, and got him a couple of much-needed bottles of water and a straw. I think it would’ve been a lot less humorous if it had been anyone else – there aren’t too many terrible jokes you can make about helping a moonkin, or your average draenei….. But a conversation with Arthas? Priceless. For some reason, the polite thing to do seemed to be to NOT ask him for yet another picture, so I didn’t take one with him, but I did find one of him on stage for the Costume contest over at Ten Ton Hammer. 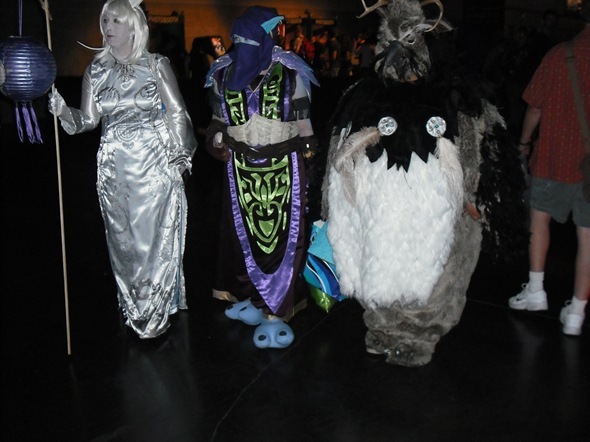 After taking my leave from Arthas, it was time to make my way over to the main stage so that we could try to get seats for the costume contest. Jay Mohr was back as Master of Ceremonies, and although rambling, he was hysterically improving the entire ordeal. Tyler Winegarner from Game Spot put together the best, in my opinion, gallery of the Costume Contest, so head over there to check them out! I was very disappointed that Audrey Yeager, who did the Troll Female two years ago, and Draenei Female last year didn’t make an appearance. Katie, from Miami, who won last year with an awe-inspiring Female Undead, got cut off before the part of the music she was working up to, which was unfortunate. This year’s winner was quite good, though, and it’s nice to see the under-appreciated Dwarf Females get some love. Which is Lodur and @kikirowr from twitter. There may have been Tequila involved for the rest of the night… I’m not sure. Hereâ€™s the thing about an event like Blizzcon â€“ there is SO MUCH going on that it overwhelms your senses and strips you of your faculties. You may have all the best intentions of blogging about every little detail, but what you end up coming away with is a jumble of emotions mixed with imagesâ€¦. and ringing in your ears if you stayed for Ozzy. 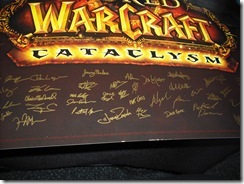 If you want coverage of Cataclysm, specific panels, or any other information, you can find the info on the official site, WoW.com, and even You Tube. If you want to hear about this Trollâ€™s experience, keep reading! Good lookinâ€™ bunch, if I do say so myself. Syd, unfortunately, couldnâ€™t join us this year. 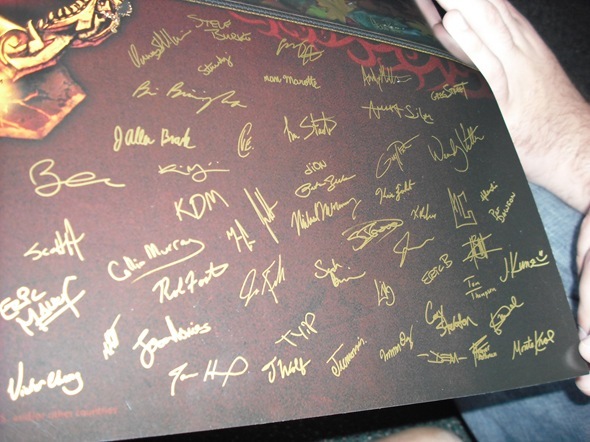 (But Iâ€™ll be shipping her souvenir WoM Blizzcon â€˜09 shirts!!) Iâ€™d also like to take a second here to thank our sponsor, Byte Me Gaming, for such amazing shirts. They have been so kind to our team, and we really appreciate their support! But, you know what? I think these people have put on a Con or two before, because that long, long, long line kept moving. And we made it inside for the start of the Opening Ceremony. We didnâ€™t make it in time for SEATS, of course, but that didnâ€™t matter â€“ there were massive screens throughout the convention center to broadcast whatever seemed to be the most popular panel. You could walk around, check out the exhibits, play with the toysâ€¦ and not miss a single thing. 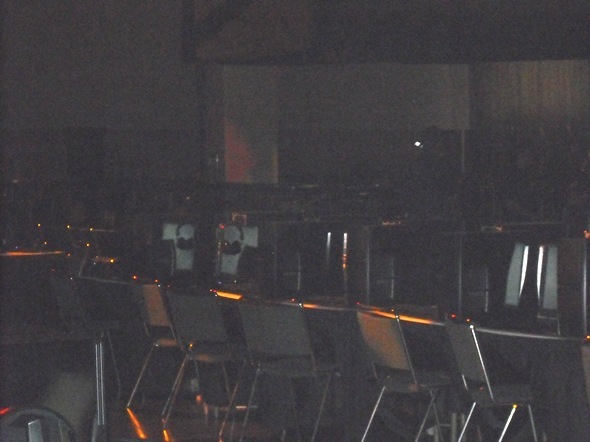 Sorry that oneâ€™s a bit blurry, but you can see the screens that were all over the place. 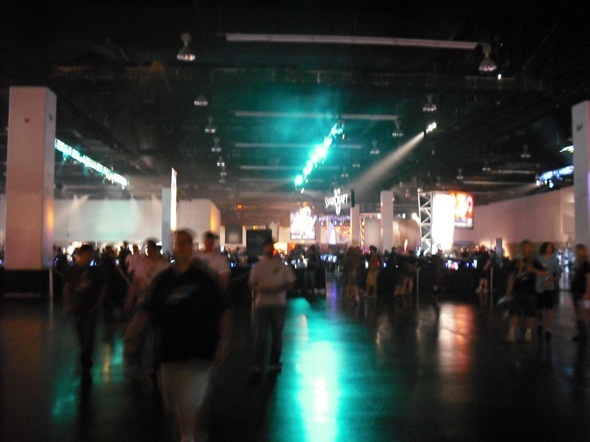 Iâ€™m not sure how many of you have been to convention center expos, but usually the overhead lighting is fluorescent and harsh â€“ Blizzcon is dark, and dramatically lit by colored, flashing track lights. Vendors are handing out glowsticks and necklaces, and it really helps keep the entire place cool, even with 25,000+ bodies inside. 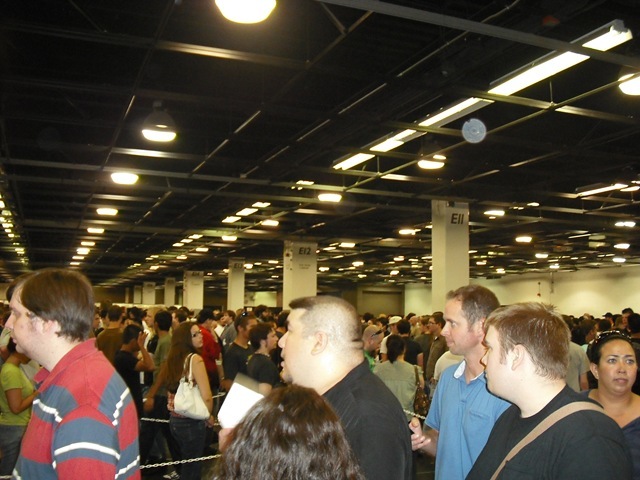 There were so many cool exhibits and vendors to check out, but they kept as much floorspace open as possible â€“ the layout was sheer genius, with plenty of space for groups of people to walk through without bashing into each other. The stars of the con, though, were the people in costume â€“ but more on that, later. Okay, so Iâ€™m inside now. I have no idea where Lodur got to, Matticus has run off to watch the Opening, my boyfriend yelled something over his shoulder as he sprinted towards the Starcraft II playable area, (True facts: He stood in line and played Starcraft II something like 5 times over the course of the two days. When that game comes out, I donâ€™t think Iâ€™m going to see him again for a few months.) andâ€¦ the opening ceremony is standing-room only. 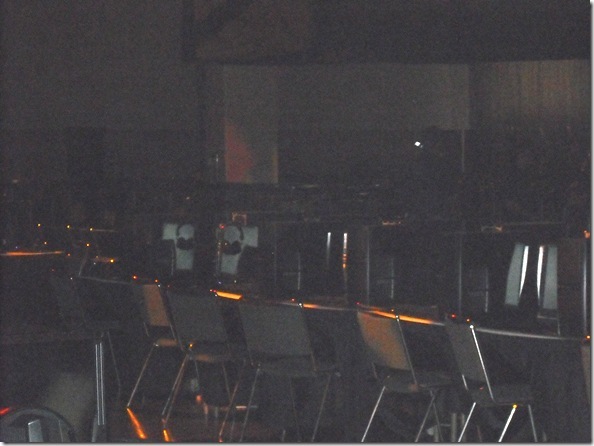 So I wander off by myself, watching on the screens, listening to the welcome, and other announcementsâ€¦. when I notice another bank of computers, like the ones set up for Starcraft II and Diablo III. But these are all shut off. The signs are all covered in black crepe. What game could possibly need to be demoâ€™d and played by con-goers, but have no signage? Perhaps the UNANNOUNCED EXPANSION?!?! I roll them dice, and hop over the chains set up to corral a non-existent line. At this point, I frantically call Matticus and tell him he has to come get in line with me, because if Iâ€™m right, this is about to become the longest line at the convention. Thatâ€™s his â€œI hate it when sheâ€™s rightâ€ face. And he should hate it. Because I like to gloat. A Lot. The computers are all turned on, and we file in as quickly as we can so we can snag as much playtime as possible. They limited us to 20 minutes, and we could play either Worgen or Goblin. They started us at level 6, and content was ready up to level 10. (If you could get there in 20 minutes.) 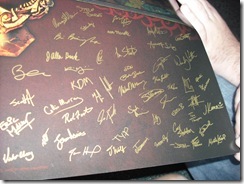 As incentive for players to complete quests, rather than just run amok, quests that offered an item (as opposed to just money) as a reward ALSO gave a â€œRed Blizzcon Bagâ€ which, when opened, might contain a nice green item, or something that translates into a real-world win of a poster or video card. As soon as the guy in charge of our section mentioned this, I won a poster! â€œThe first one of the Con! !â€ He told me. I rarely win anything, so I was beyond excited, but I didnâ€™t look at it much â€“ I just wanted to get my 20 minutes worth. Matt played Goblin, and I chose Worgen. A few of you may remember that I started out as Alliance on a Human Priestâ€¦ and the Worgen are amazing enough that I may dabble back on that side. 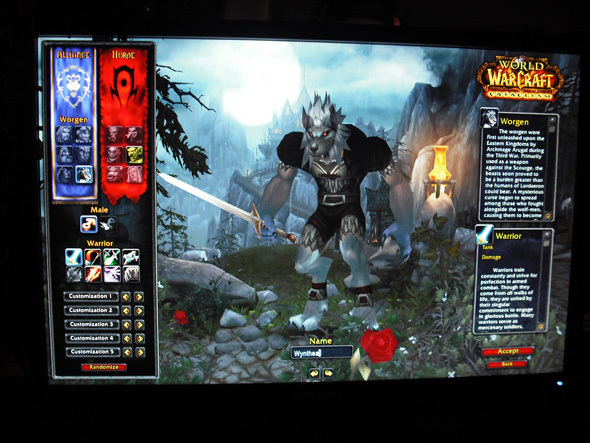 One of the things I love best about WoW is the obvious attention to detail and story â€“ and this new race is no different. The starting zone has a decidedly gothic, almost steampunk feel to it, but manages to be nothing like Duskwood or Undercity. It borrows from previous human elements in the game, but the time that Gilneas has spent isolated is obvious â€“ in everything from architecture to NPC costumes. (They wear tophats!!!) It reminds me of the first time I stepped into Howling Fjord, and saw the new take on the Undead look and feel. This has a similarly awesome twist on new/familiar themes, and is breathtaking. Unfortunately, we didnâ€™t get to see or play with any of the old world as transformed by the cataclysm, but I plan on hurrying a bit more to finish my Loremaster title!!! I havenâ€™t yet figured out who all of the signatures belong to, but it looks like the entire development team. 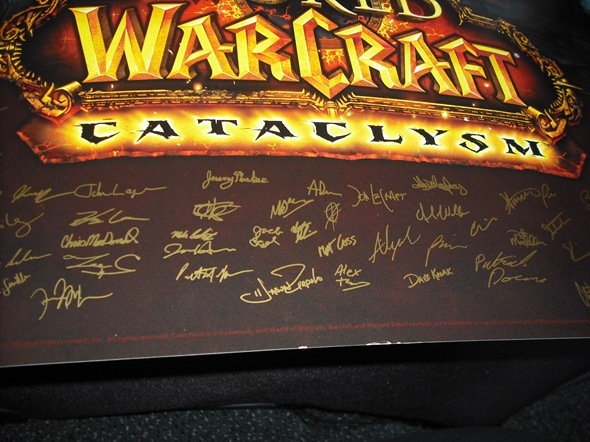 I asked one of the guys working the Cataclysm demo about it the next day, but he hadnâ€™t heard anything about a fully signed poster at all â€“ and guessed it was special because it was the first one. Itâ€™s sitting in a poster tube right now, until I can find a frame for it to go in my living room, over my computer. Another small misadventure happened where in the excitement, I left my phone next to my demo computer. Iâ€™d like to give a huge THANK YOU to the staff at Blizzcon who found it, turned it in, and even walked with me to the lost and found when I didnâ€™t know where it was. My experiences with everyone working, both for Blizzard and for the Anaheim Center were absolutely top notch â€“ Itâ€™s no wonder Blizzcon is in the same place every year, the venue is fantastic. At this point, my boyfriend and I both had goodies we didnâ€™t want to carry around the convention, so we headed back to the hotel room and grabbed a quick lunch before coming back. My plane lands, we get our gear, and walk out the airport. My boyfriend and I hadn’t really come up with a solid plan for getting to the hotel, but there in the California afternoon sun was a gigantic bus with DISNEY on the side. We looked at each other, giggled, and got on board. One of the neatest things about iPhones is the built-in GPS, so we figured out that we could get dropped off at the Disney hotel, walk past the convention center to pick up our goodie bags and badges, then head on to our real hotel. That took about an hour – they kept it moving as fast as possible. Meanwhile, I was on the phone nonstop, texting Lodur, Matticus, and my Guildmates. Turns out my GM was in line behind me, and I got to meet him in person for the first time, along with a couple of my other guildies! The guild went out for dinner afterwards – we had about 10 people all together. In typical fashion, I was the only Lady. 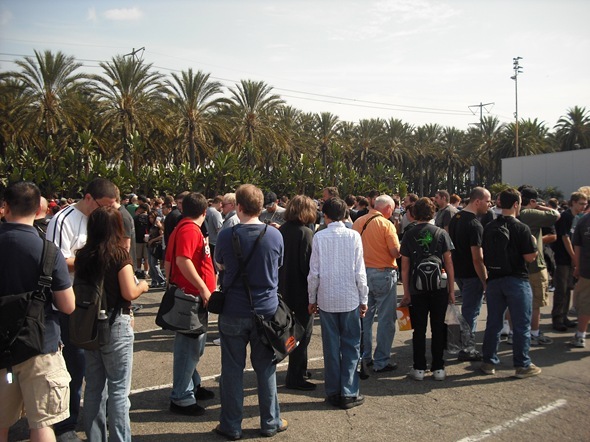 That’s one thing about Blizzcon – while women are the fastest growing gaming demographic, there was still never a line for the Ladies’ room. Which is a nice change. Lodur and I were staying at the same hotel, so after dinner I got to meet him in person for the first time, along with a few of his guildies. Stories were swapped, drinks were had, and I have no idea what time I went to sleep. Packing for a short trip can seem harder than packing for a long one – you need pretty much all the same stuff, just in smaller amounts. 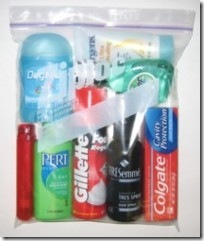 I travel frequently, and have gotten used to packing everything I need in about an hour. 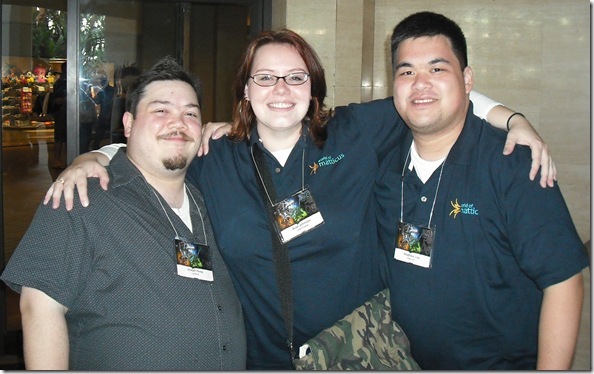 Here’s my mental checklist, and a few additions that other people might commonly need, to help take the stress out of your trip to Blizzcon. Think about what you do as you get ready in the morning, and as you prep for bed at night. Take a day and think about it as you’re getting ready. Put everything you use in a pile instead of putting it away. That’ll give you a pretty good idea of what you need to bring with you. Hair styling products: Rubber bands, gel, hairspray, etc. Check and see if your hotel has hair dryers available if that’s something you use daily. Most of them take up a lot of space in your bags, and while you can get travel size models, it’s better to not have to buy an extra one that you won’t use much. Travel size stuff is DEFINITELY worth it, though, when it comes to toiletry products. Check the cosmetics section of your local store for either small sizes of things like toothpaste, shaving cream, and body wash, or for small, empty bottles that you can fill from your larger bottles at home. Post September 11th US Travel Regulations require all liquids in carry-on luggage to be 3 oz or less, and for all of your 3 oz. bottles to fit into a single 1 quart zip-top bag. If you have to bring a bigger bottle, you’ll have to put it in a checked bag, rather than a carry on. Some airlines charge extra for ANY checked bags, so if that’s your plan, double check to make sure you won’t have any extra fees. Are you planning to go to Disney Land? Stay an extra day or two? Do you get cold easily? Do you usually wear sneakers or sandals? But how much to bring? Bring 1/2 as many pairs of pants as there are days in your trip. Pajamas. ESPECIALLY if you have a roommate!!! ID – Passport (if coming from outside the US), Drivers’ License, School ID.. .Just something with your photo on it. Bring two, just in case, and keep them in different places. Electronics. Camera, iPhone, iPod, Cell, Laptop. Chargers for your: iPod, Camera, Laptop, etc. This isn’t really my area of expertise, but a few things come to mind. I realize that some will have more specific needs, but this should cover most people. Feel free to make additions in the comments. The best thing to remember is that Anaheim is not in the middle of nowhere, and if you forget something, you’ll likely be able to get it there. See you soon!! Decide whether this is a Holy build, or a Discipline build. For this example, I’ll walk you through my Holy spec, my reasons for each point, and where you could easily change it to suit yourself – and which changes wouldn’t be as helpful. For Tier 1, take a look at your crit on your character screen. The idea here is that you want enough crit to get the mana saving goodness that is Surge of Light and Holy Concentration with reasonable reliability. Since Holy is largely a raid-healing spec, your three major raid-healing spells are Circle of Healing, Prayer of Mending, and Prayer of Healilng. CoH hits 5 people (6 if glyphed), ProM hits 5 (6 with 2-piece T7, assuming full duration), and ProH hits 5. If you have 2-piece T8, ProH gets 10% extra chance to crit. 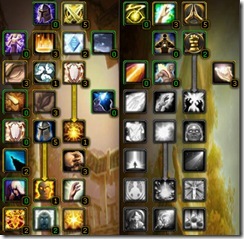 Because in the first tier, Holy Specialization allows you a tremendous amount of control over the crit chance of your heals. Having around 20% crit unbuffed (25% fully raid buffed) gives you a 1-in-5 crit chance for each 5-target raid heal, with the raid buffs allowing some insurance. As with everything heal-related, you want to react as quickly as possible, and KNOWING that you will get a free, instant Flash Heal after every AoE allows you to plan ahead. If you have enough crit on your gear to get you to that threshold, you can start subtracting points from Holy Specialization. 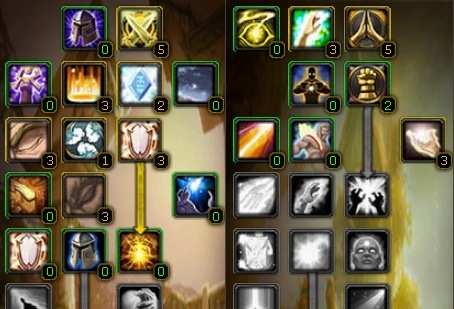 Personally, I like having the freedom to stack a bit more Spell Haste on my gear, so I choose to max out Holy Specialization so that my crit isn’t lacking. If Renew is something you use, or plan to use, a lot, pick up the three points in Improved Renew. 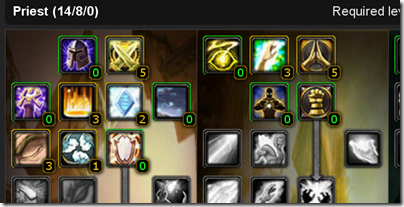 Healing Focus – for this talent, consider the content your guild is working on. Are you having trouble keeping yourself and your assignment alive during Mimiron? This could be a great option. Aside from that, there just aren’t many fights where the pushback will kill you, and you’ll be too far away from a Paladin that could use Concentration Aura – or another healer that can help you until the danger has passed. Tier 2 gives you even more wiggle room. Spell Warding will help you if you tend to die to spell damage. If you’re building a spec specifically for Mimiron or Mimiron hard mode, this will help protect you from his Rapid Burst ability. However, it’s five points that help NO ONE except you. 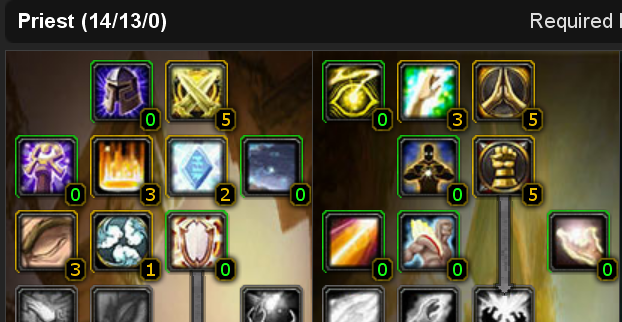 Since I do all of my dailies in my Holy-raiding spec, I go ahead and max this out. It only costs me one extra point, which I steal from Improved Healing. Tier 3 includes an easy decision: Max out Inspiration. Even though this is a raid-healing build, it’s a guarantee that some of your AoE will land on the tank. Spreading the love around won’t hurt the rest of the raid, either – if anything, it’ll make your job easier. Desperate Prayer is completely up to you, but I find it very useful. It’s cheap, instant, has a short cooldown, can crit, and is a GREAT “Oh Sh–! !” button, especially now that pots are only once-per-fight. 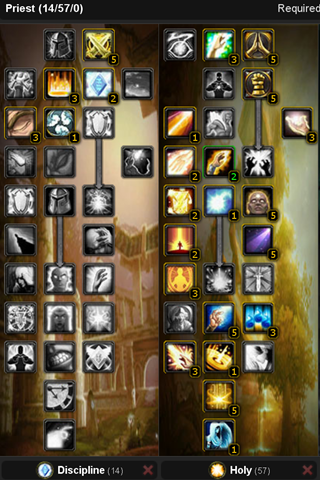 In tier 4, since this is a healing build, forget about Searing Light. 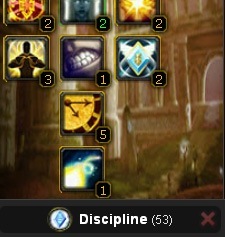 To move forward, you’ll need 5 points between Holy Reach and Improved Healing, or 4 if you also maxed out Divine Fury. Since Improved Healing only affects Greater Heal (which I use rarely these days) and Divine Hymn (Which I always Inner Focus), I give Holy Reach both points, and stick just 2 in Improved Healing for filler. (You could also completely bypass Improved Healing by putting these two points in Healing Focus.) In my opinion, that 5% savings on a heal I don’t use often is less efficient than the extra radius on my AoE heals. (And I’m more comfortable putting that point into Divine Fury, where on the rare occassions I do need Greater Heal, it will be fast enough to be effective.) Although you’ll run into many people who are perfectly comfortable with 1 point in Holy Reach, you will rarely see Holy builds that skip it entirely – you want CoH and ProH to have the chance to hit as many people as possible. If you skipped Healing Focus, you’ll notice only 1 point in Improved Healing is needed to move forward. You can easily plug that point into Lightwell, Blessed Resilience, or Test of Faith later in the tree. Once you reach Tier 5, maxing out Spiritual Guidance is a no-brainer, since it’s a flat-out increase to your spell power. Similarly, don’t skip Spirit of Redemption, since one point here buys you an extra 5% spirit. (Which, obviously, also increases your spell power in addition to your regen. It’s also nice to not ever have to inform your raid leader when you need a battle-rez, since it will be glaringly obvious.) Your other choice in this layer is Healing Prayers, and since Prayer of Healing and Prayer of Mending each benefit from set bonuses, and the AoE damage in Ulduar encounters makes Prayer of Healing your work-horse spell, skipping Healing Prayers is mana-suicide. Max it out. By now, you’ve got more than enough points in Holy to get you to Tier 8, but this part of the tree is thick with awesome points. Still in tier 7, Holy Concentration is one of the best talents we have to increase our mana-regen, and you’ll find yourself gasping for water on longer fights without it. Combined with Surge of Light, this is one of the main reasons that crit is important for Priests these days. Take all 3 points. Lightwell, on the other hand, is a polarizing point. There are enough points in this particular spec that you can take it if you have trained your raid to use it properly, just either drop Divine Fury down to 4 points or Improved Healing down to two. Both of these will impact your Greater Heal (the former will nerf your cast time by .1 seconds, the latter will increase its mana cost by 5%.) Personally, I skip lightwell altogether. iii) Calculations with Blessed Resilience & Test of Faith (w/ spiritual healing modifier) – I found something interesting testing with Renew. If the spell is cast below 50%, the ticks (even if the health goes higher than 50%) stay with the 12% increased effectiveness. So those are some pretty plain numbers. If you find yourself casting greater heal more than once in a blue moon, perhaps stick with Empowered Healing. If you regularly find yourself not casting it at all during fights then a spec for better output would first put the 5 points from empowered healing to 3/3 blessed resilience and then 2/3 Test of Faith. The bottom line here is that putting 3 points in Blessed Resilience along with 2 in Test of Faith increases the amount healed on targets below 50% by a significant amount. If you’re looking to take advantage of Test of Faith in the next layer of the tree, it’s a good idea to pair it with Blessed Resilience – and you can easily take the points from Empowered Healing to make that happen. It’s entirely a play-style dependent call, and I personally prefer the constant levels of healing provided by Empowered Healing to the low-health dependent benefits of Test of Faith. Moving into tier 8, you’ll find some of your decisions have already been made, due to the preceding math. If you decided to put Sindaga’s 3 points into Blessed Resilience, you have already decided to skip Empowered Healing. If you decided against the BR/ToF combo, you’ll max it out instead. The other talents in this layer are Serendipity and Body and Soul. Although I’ve read some arguments that the self-poison cleanse is useful on the more poison-heavy encounters in Ulduar, if your Shamans, Druids, and Paladins are doing their jobs, you won’t need Body and Soul. Serendipity, on the other hand, plays a major role in making Holy a more synergistic healing spec. Layering spell haste for your bigger heals is a huge part of the raid-healing strategies for fights like Ignis, Deconstructor, Freya, and Mimiron. My typical heal pattern takes careful advantage of this: Inner Focus-Prayer of Healing -> Surge of Light-Flash Heal -> Binding Heal -> Circle of Healing -> Surge of Light-Flash Heal -> Serendipitous- Prayer of Healing -> Surge of Light-Flash Heal…. into infinity, peppered with Prayer of Mendings and Renews as much as possible, both of which provide extra Surge of Light procs, and, therefore, free layers of Serendipity to haste my next Prayer of Healing. Make sure you take maximum advantage of Serendipity. Like tier 8, you’ve already made quite a few decisions regarding tier 9, without realizing it: If you picked up Improved Renew in tier 1, you would shortchange yourself to skip Empowered Renew. 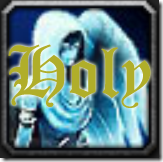 When you decided to build Holy, you decided to take Circle of Healing, (I know there was a lot of noise about avoiding it when they added the 6 second cool down, but with its coefficient balanced to reflect the cooldown, the glyph to increase it to 6 targets, and its ability to proc Surge of Light, skipping Circle of Healing would be foolish.) And when you decided between Empowered Healing and Blessed Resilience, you decided whether you would take Test of Faith as part of the Blessed Resilience package. 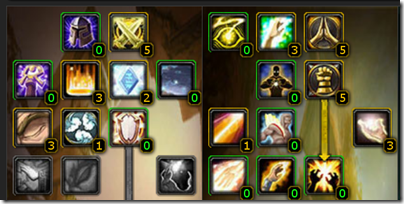 If you’re following my build, take all three in Empowered Renew, Circle of Healing, and skip Test of Faith. For tiers 10 & 11, you’ll notice you have exactly 6 points left. Finish out your spec by finishing out the tree with 5 points in Divine Providence, and the last into Guardian Spirit. This is my completed spec – and I fully expect as many detractors as I do compliments. 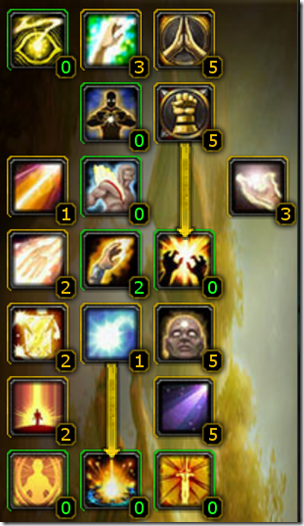 Lightwell may work for you and your raid, or perhaps you think I’m foolish to finish out Divine Fury rather than taking Healing Focus. I’d love to hear about tweaks that you make (and how they work for you), but for me this is my perfect spec – Renew-heavy, allowing me to stack haste, and with Desperate Prayer the only concession to keeping myself alive rather than focusing on my raid. In 3.1, PvE Priests are in a good place. We have two distinct and raid-viable healing specs, and enough good places to put our talents that you can make arguments for several “cookie-cutter” builds. After introducing each talent, I’ll spend some time showing how to actually make a build – by walking you through mine, as well as other examples. 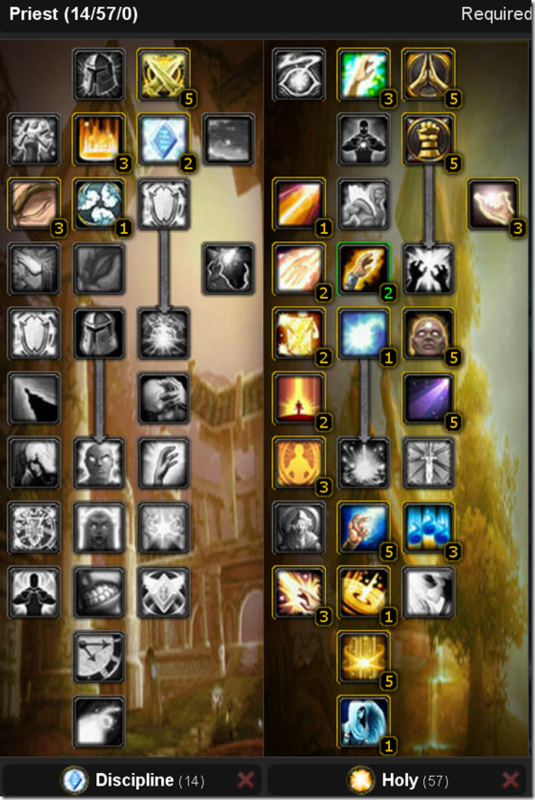 A quick note on our beloved Disc tree: If you Google Priest Specs, you’ll likely find a lot of people talking about how Priests have “14 mandatory talent points.” (Sometimes they say 13.) What they really mean is that there are some talents in the Disc tree that are so universally outstanding that every Priest should take advantage of them – PvE, PvP, Holy, Disc, or Shadow. These talents are Twin Disciplines, Improved Inner Fire, and Meditation. It takes 10 points in Discipline to get to Meditation and 3 to max it out. The 14th point is Inner Focus, which I agree should be considered mandatory. You can fool around a little in the 2nd tier with Improved Fort, Martyrdom, and Silent Resolve, but skipping those others will handicap any spec you try to put together. Outstanding for PvP, but no longer the premiere choice for the first tier of a PvE build. Twin Disciplines: Increases the damage and healing done by your instant spells by 5% per rank. This is your bread and butter for any PvE build. Renew, Circle of Healing, Prayer of Mending, Desperate Prayer, Holy Nova, PW:Shield, SW:Pain, SW:Death, Devouring Plague, Flash Heal and Smite (when made instant by Surge of Light), and the Glyph effects for both PW:Shield and Dispel Magic all benefit from this. You could make a strong argument for this in PvP as well. Silent Resolve: Reduces the threat generated by your Holy and Discipline Spells by 7% per rank (capped at 20%) and reduces the chance your helpful spells and damage over time effects will be dispelled by 10% per rank. For PvE, the threat reduction can be helpful when running 5-mans with pugs, or on fights like Auriaya or Ignis where there’s a lot of raid healing and random adds popping up. For PvP, this keeps your DoTs ticking, and your Renews and PW:Shields where they belong. Improved Inner Fire: Increases the effect of your Inner Fire spell by 15% per rank, and increases the total number of charges by 4 per rank. This will increase the Spell Power gained from 120 to 174, and the charges from 20 to 32. For PvP or PvE, you want this talent. Improved Power Word: Fortitude: Increases the effect of you PW:Fort and Prayer of Fortitude spells by 15% per rank and increases your total stamina by 2% per rank. As long as one Priest in the raid has this talent, the others could technically do without it, but you’ve got to put two points into something in this tier to get to the next level. For PvE, it should either be Silent Resolve or this. For PvP, Martyrdom would probably be a better choice; the 4% total gain to personal stamina is nice in PvP, but it’s not going to make or break you. Martyrdom: Gives you a 50% chance per rank to gain the Focused Casting effect that lasts for 6 seconds after being the victim of a melee or ranged critical strike. The Focused Casting effect reduces the pushback suffered from damaging attacks while casting spells and decreases the duration of Interrupt effects by 10% per rank. Brilliant for PvP (and in my opinion, more useful than Imp:Fort), but next-to-useless for PvE. Meditation: Allows ~17% per rank (50% at max) of your mana regeneration to continue while casting. Disc, Holy, PvE, PvP, Shadow…. Take this talent, and max it out. Inner Focus: When activated, reduces the mana cost of your next spell by 100%, and increases its critical effect chance by 25% if it is capable of a critical effect. Priests argue whether this one is actually mandatory. To an extent, it’s a function of playstyle – I always use this for either Prayer of Healing or Divine Hymn since they are the most expensive. Because of that, I use this every time it’s off cooldown. The added crit also means an almost guaranteed Surge of Light and Serendipity proc. It’s also a nice last-ditch effort when you’ve run out of mana. Really, I just can’t figure out where you’d get more benefit from spending a single point. Increases the damage absorbed by your PW:Shield by 5% per rank. Brilliant for PvE or PvP disc builds. You also must max this out to access Soul Warding. Absolution: Reduces the mana cost of your Dispel Magic, cure Disease, Abolish Disease, and Mass Dispel spells by 5% per rank. For PvE-Disc, this can save you a TON of mana over the course of a fight like Hodir or Yogg-Saron. For PvP, don’t leave home without this – remember that you’re not only dispelling and curing your teammates, but offensively dispelling your opponents. If you’re this deep in the Disc tree, you’re not going to be getting Surge of Light procs, but this still impacts Renew, Prayer of Mending, Desperate Prayer (if you took it), Holy Nova, PW:Shield, SW:Pain, SW:Death, Devouring Plague,and the Glyph effects for both PW:Shield and Dispel Magic. Not a bad place to put points to get you to the next tier. the casting time of your Mana Burn spell by .5 seconds per rank. Utterly useless for PvE. Absolutely essential for PvP. Reflective Shield: Causes 22% or 45% of the damage your absorb with PW:Shield to reflect back at the attacker. This damage causes no threat. Originally designed to work no matter who you had shielded, the code proved too complex. For now, this only works when the shield is on you. Pro for PvP, this has basically zero application in PvE. I think if this were lower in the Disc tree, it would become another “mandatory” talent. For raiding, Int. scales your replenishment and increases your crit. The total mana regen formula is also largely dependent on int. If that wasn’t enough, you also have to max this out to access Power Infusion. Soul Warding: Reduces the cooldown of your Power Word:Shield ability by 4 seconds, and reduces the mana cost of PW:Shield by 15%. If you’re this deep into Disc, you already know that Shield is one of your most-cast spells. This removes the cooldown (why does it have that, anyway? ), and makes it cheaper. You’ll get a lot of mileage out of this one point, especially PvE-ers with the 4-piece Tier 8 bonus. (+250 Spell Power after casting PW:S.) You have to max out Improved PW:S to take this. Focused Power: Increases damage and healing done by your spells by 2% per rank. In addition, your Mass Dispel cast time is reduced by .5 seconds per rank. PvE-ers will want the increase to spell power, and appreciate the cast-reduction on fights where Mass-dispel is needed. PvP-ers will want both effects. Highly Recommended. Enlightenment: Increases your total Spirit and Spell Haste by 2% per rank. Spirit will increase your mana return, and Spell Haste is becoming more and more important. You could argue about this talent, but it’s a very solid choice for PvE or PvP. Focused Will: At max rank, this increases your spell critical effect chance by 3%, and after taking a critical hit you gain the Focused Will effect, reducing all damage taken by 4% and increasing healing effects on you by 5%. Stacks up to 3 times, lasts 8 seconds. In PvE, you can make a good argument for 3% crit. In PvP, this will increase your survivability tremendously. An interesting detail is that even when you’re wearing resilience gear, this talent will work if you WOULD have been crit, but a crit is prevented by your gear. Nice. Power Infusion: Infuses the target with power, increasing spell casting speed by 20% and reducing the mana cost of all spells by 20%. Lasts 15 sec. 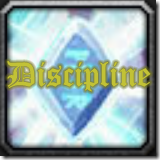 This is one of the defining spells of a Discipline spec. Requires 5 points in Mental Strength. You can cast this on yourself, or make best-buddy friends with a mage. Improved Flash Heal: Reduces the mana cost of your Flash Heal by 5% per rank, and increases the critical effect chance of your Flash Heal by 3% per rank (10% at max) on targets below 50% health. You’ll be Flash Healing whenever penance is on cooldown – even if you didn’t need these 3 points to get to the next tier, this talent would be a major part of the mana-efficiency that makes Discipline such a strong spec. Renewed Hope: Increases the critical effect chance of your Flash Heal, Greater Heal, and Penance (Heal) spells by 4% on targets afflicted by the Weakened Soul effect, and you have a 100% chance to reduce all damage taken by 3% for 20 seconds to all friendly party and raid targets when you cast PW:Shield. So, when you shield someone, your major heals heal for more on them. You also reduce the total amount of damage they take, period, in addition to what is absorbed by the shield itself. This talent is amazing for either PvE or PvP. Rapture: At max rank, when your PW:S is completely absorbed or dispelled, you are instantly energized with 2.5% of your total mana, and you have a 100% chance to energize your shielded target with 2% total mana, 8 rage, 16 energy, or 32 runic power. This effect can only occur once every 12 seconds. Getting mana back is a Very Good Thing, whether you’re killing bosses or player-opponents. Helping your team or raidmates have more resources is also a Very Good Thing. This talent is awesome for PvE, and due to the Dispel mechanic, equally so for PvP. Maybe more so. Aspiration: Reduces the cooldown of your Inner Focus, Power Infusion, Pain Suppression and Penance spells by 10% per rank. 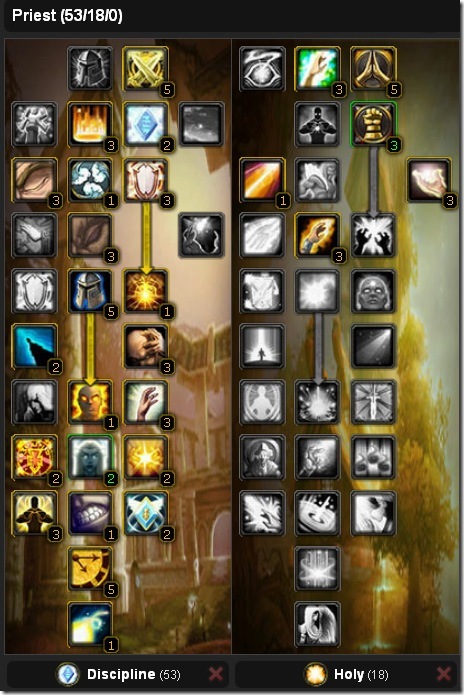 As Disc, these are the spells that more or less make your spec. Allowing you to cast them more will allow you to do your job without always being on cooldown. PvE or PvP, you want this. Divine Aegis: Critical heals create a protective shield on the target, absorbing 10% per rank of the amount healed. Lasts 12 sec. This provides an additional shield to Power Word:Shield, that scales with your Spell Power. As Disc, providing preemptive healing is one of your major benefits, especially as you venture further into single-target healing. A must-have for PvE, and a solid choice for PvP. Pain Suppression: Instantly reduces a friendly target’s threat by 5%, reduces all damage taken by 40% and increases resistance to Dispel mechanics by 65% for 8 sec. In PvE, 5% threat shouldn’t break a tank in a raid scenario – this is an excellent extra cooldown for those fights where the boss hits extra hard on a regular basis. (Think Mimiron Phase 1, or General Vezax). For PvP, the life you save could be your own, and it’ll even help you hang onto your PW:S and Renew. Grace: Your Flash heal, Greater Heal, and Penance spells have a 50% chance, per rank, to bless the target with Grace, increasing all healing received from you by 3%. This effect will stack up to 3 times. Effect lasts 15 seconds. Grace can only be active on one target at a time. Maxed out, this gives you a 100% chance to increase your healing on one target by 3%, stacking up to 9%, for 15 seconds. I think you can manage to throw a Flash Heal or Penance every 15 seconds on your MT. Don’t skip this for PvE. For PvP, you’ll see less benefit from this, but in 2v2 or situations where one of your teammates is being focused, it can help a lot. Borrowed Time: Grants 5% per rank spell haste for your next spell after casting Power Word: Shield, and increases the amount absorbed by your Power Word: Shield equal to 8%, per rank, of your spell power. As if you needed another reason to cast PW:Shield. Maxing out at 25% spell haste after casting a Shield, and an additional 40% of your spell power added to the power of your Shield means more mitigation for raid damage or single-targets, and faster heals from you. A Disc on raid duty will use this for Prayer of Healing. On the Tank, it will help you drop faster Greater Heals (or anything else.) For PvP, this also synergizes well with Reflective Shield, dealing more damage to your attacker. Penance: Launches a volley of holy light at the target, causing 375 Holy damage to an enemy, or 1484 to 1676 healing to an ally instantly and every second for 2 seconds. Penance is a little funky, because of its dual nature. It ticks three times: Immediately, 1 second later, and 1 more second later. 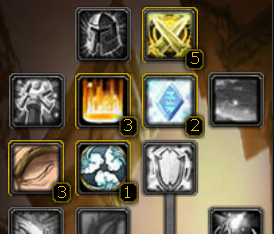 Each tick has the chance to crit (and proc Inspiration, Divine Aegis.) Talented, this 10 second cooldown is 8 seconds. You can glyph it down to 6.4, but remember: it has a 2 second channel time – so 2 of those 6 seconds don’t matter anyway. The damage range is 30 yards, the heal is 40. It’ll heal for something like 8-12k, and damage for 2-4k at lvl 80. This spell is AWESOME. A note on the Holy tree: as a rule of thumb, and especially in 25-man raid content, Discipline Priests will specialize in single-target (tank) healing, and Holy Priests in multi-target (raid) healing. So, Holy Priests will spend the mandatory 14 points in Disc, and Disc Priests will put enough points into Holy to get Inspiration, because of its huge benefits to tank healing. Discipline priests who don’t do this will find themselves at a serious disadvantage when healing tanks. I’m also operating under the assumption that serious PvPers will be spec’ing Disc, since it’s amazing right now, and the PvP applicable talents in the bottom of Holy are largely outshone by their Disc counter-parts. I’ll still point them out when they come up, however. Healing Focus: Reduces the pushback suffered from damaging attacks while casting any healing spell by 35% per rank. There’s some debate over how effective this talent is, compared to your other options in the holy tree. Basically, the only top-end fight where spell pushback is bad enough to kill you is Mimiron. If you find that you cannot survive this fight due to blasts, by all means take this talent – it, and a Paladin with improved concentration aura, will help your survivability immensely. For all other PvE encounters, there are better places to put the points. For PvP, this just might save your life, or your teammates – take it! Improved Renew: Increases the amount healed by your Renew spell by 5% per rank. Synergizes exceptionally well with Empowered Renew, for those going deep Holy. For Disc builds working towards Inspiration, this is also an excellent choice, since Renew benefits from Mental Agility and Twin Disciplines. It won’t give you the full 5 points you need to get to Tier 2 talents, though. For PvP, I find it helpful to have a bigger spell that’s castable while mobile – and with all the help the Disc tree offers to keep your spells from being dispelled, there’s a high chance it will last long enough to do quite a bit of good. Holy Specialization: Increases the critical effect chance of your Holy spells by 1% per rank. Another good choice for Disc Priests working toward Inspiration, this is also worth maxing out as you work towards gear caps. Personally, I find that 25-30% Holy Crit (when fully raid buffed) provides a guaranteed Surge of Light proc off either Circle of Healing (especially when glyphed) or Prayer of Healing (especially with 2-piece T8 and/or Inner Focus activated). Once you’ve reached that soft cap, feel free to reduce the points here to take either Healing Focus or max something out further down the tree. For PvP, I personally take 2/2 Healing Focus and 3/3 Improved Renew to get to the next tier – there are talents that will provide more reliability and stamina that are more worth the points. Spell Warding: Reduces all spell damage taken by 2% per rank. I’ve seen suggestions that Spell Warding also helps on Mimiron, and other AoE-heavy fights in Ulduar. My opinion is that for 5 talent points I can either increase my PW:Shield to protect me from ALL damage, or increase my healing to keep me and the other people that I’m healing (can’t forget about them!) up through the damage. For PvP, however, this can save you against burst damage attacks from pesky mages, and the ongoing drain from warlocks. Divine Fury: Reduces the casting time of your Smite, Holy Fire, Heal, and Greater Heal by .1 seconds per rank. Desperate Prayer: Instantly heals you for 263-325. 2 min cooldown. At lvl 80, this hits me for around 5-6k, and can crit. This point is all about personal playstyle. I have a bad habit of staying too long to get off just.one.more.heal. This helps keep me alive when I finally run away. If you find yourself not having any problems staying alive, feel free to skip it. For PvP, anything insta-cast that helps you is a good idea, so make sure you have this. Blessed Recovery: After being struck by a melee or ranged critical hit, Blessed Recovery heals you for 5% per rank of the damage taken over 6 seconds. Additional critical hits taken during the effect increase the healing received. This talent is as mandatory for PvP as it is useless for PvE. Inspiration: Increases your target’s armor by 8% per rank (25% max) for 15 seconds after getting a critical effect from your Flash Heal, Heal, Greater Heal, Binding Heal, Penance, Prayer of Healing, or Circle of Healing. Anyone planning to heal a tank is short-changing themselves if they don’t take this talent. (That should be everyone, even dedicated raid-healers. It proc’s off all your AoE heals, too.) For PvP, any increase in armor is a good thing when you’re wearing a dress. Holy Reach: Increases the range of your Smite and Holy Fire spells and the radius of your Prayer of Healing, Holy Nova, Divine Hymn, and Circle of Healing spells by 10% per rank. Holy Dpsers will want this for sure. 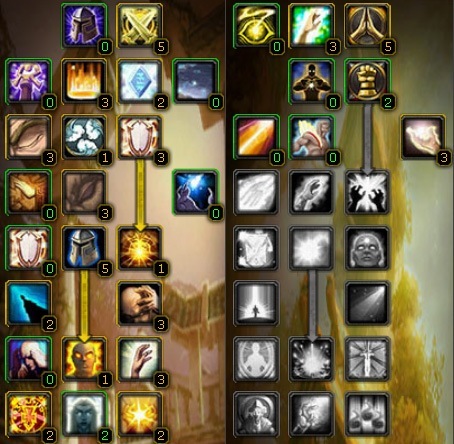 For PvE healers, the current debate is whether 1 point is sufficient – I find that on AoE heavy, yet very spread out, fights like Deconstructer and Hodir, I appreciate any extra range I can get. Disc Priests can feel free to ignore this – If you’re going this far into Holy it’s for the next talent. PvPers will need to check their personal style – but most arenas are so mobile and small, that I doubt you’ll see much benefit. Improved Healing: Reduces the mana cost of your Lesser Heal, Heal, Greater Heal, Divine Hymn, and Penance spells by 5% per rank. Very few Disc Priests will go this far into Holy, including PvPers. Personally, I DO take this talent in my Disc spec, (I steal 1 point from Rapture to do it), since it’s VERY SPECIFIC for General Vezax, and Rapture benefits on that fight are almost negligible. Holy Priests will likely need at least one point here to get to the next tier, but if you’ve looked at your combat log, and found that you don’t cast Greater Heal enough to justify these points, feel free to move them from this into something else. Searing Light: Increases the damage of your Smite, Holy Fire, Holy Nova, and Penance spells by 5% per rank. This requires 5 points in Divine Fury to unlock. PvE healers will find it utterly useless. HolyDPSers will love it. 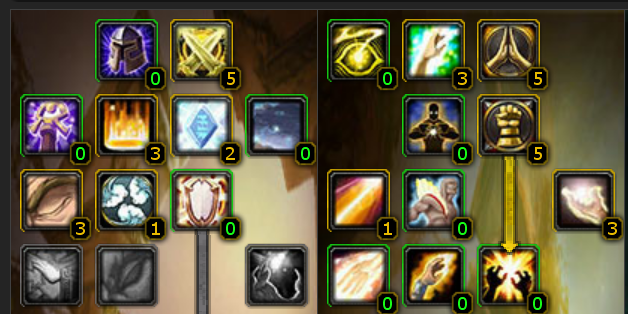 Disc PvP builds will have a hard time figuring out which points to steal from survivability viable talents to put into it. Healing Prayers: Reduces the mana cost of your Prayer of Healing and Prayer of Mending spells by 10% per rank. With all the AoE damage in Ulduar, the T8 2-piece bonus (adds 10% crit chance to Prayer of Healing), the T7 2-piece bonus (adds an extra bounce to Prayer of Mending), and the fact that Prayer of Healing is now castable on ANY party in your raid…. you’d be mad not to max this out, because you will be spamming these spells. Spirit of Redemption: Increases total Spirit by 5% and, upon death, the Priest becomes the Spirit of Redemption for 15 seconds. The Spirit of Redemption cannot move, attack, be attacked, or targeted by any spells or effects. While in this form, the Priest can cast any healing spell free of cost. When the effect ends, the Priest dies. This is your angel-form, and the beacon telling the raid that you have died. Again. I’ve been told that this is helpful after you die in PvP, but my opinion is that if you went Disc PVP instead of Holy PVP you’d probably still be alive. The reason all Holy Priests take this talent is for the 5% spirit. Increases your regen, and if you take Spiritual Guidance (why wouldn’t you? ), your Spell Power. You also have to take this if you want Lightwell. Spiritual Guidance: Increases spell power by 5% per rank of your total Spirit. You’re a Priest, so the vast majority of your gear will have a lot of Spirit. It’s likely that all of your blue sockets have either Spirit or Int/Spirit gems. You’ll get a lot of spell power out of this. Surge of Light: Your spell criticals have a 25% chance per rank to cause your next Smite or Flash Heal spell to be instant cast, cost no mana, but be incapable of a critical hit. This effect lasts 10 seconds. Holy DPSers will like this one, too. Healers will find the mobility and mana-free benefits to Flash Heal (also great for stacking Serendipity back up after Prayer of Healing, since ProH will likely give you a proc) indispensable. The debate here is whether 2 points are required. Please note that this does not increase your chance TO CRIT, but rather for your crits to CAUSE A PROC. I keep 2 points in, because I like being able to count on this after a large amount of raid damage, and I find a noticeable reduction with only 1 point. Spiritual Healing: Increases the amount healed by your healing spells by 2% per rank. Odd in that it increases healing but not damage, this should be considered mandatory for any Holy build. 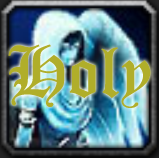 Holy Concentration: Your mana regeneration from Spirit is increased by ~16% per rank (50% max) for 8 seconds after you critically heal with Flash Heal, Greater Heal, Binding Heal, or Renew. This talent is a large source of mana regen for any Holy Build. Don’t skip it. Lightwell: Creates a Holy Lightwell. Members of your raid or party can click the Lightwell to restore 4620 health over 6 seconds. Attacks done to you equal to 30% of your total health will cancel the effect. Lightwell lasts 3 minutes or 10 charges. Most Priests who like this spell REALLY like it, and the rest of us call it LoLwell. If you can train your raid to use it properly, it can be very useful. You must take Spirit of Redemption to unlock it. Blessed Resilience: Increases the effectiveness of your healing spells by 1% per rank, and critical hits made against you have a 20% chance, per rank, to prevent you from being critically hit again for 6 sec. Body and Soul: When you cast Power Word:Shield, you increase the target’s movement speed by 30% per rank for 4 seconds, and you have a 50% chance, per rank, when you cast Abolish Disease on yourself to also cleanse 1 poison effect in addition to diseases. Another very solid PvP talent, much too far down in the Holy Tree to do much good. (and since it would synergize so well with several talents in the Disc tree, I really do wonder why it’s located here at all…. GC?) However, aside from the situational use of the self-cleanse for poison, there are better places to spend the points for a PvE healing build. Empowered Healing: Your Greater Heal spell gains an additional 8% per rank and your Flash Heal and Binding Heal gain an additional 4% per rank of your bonus healing effects. Anything that increases your Flash Heal is huge at this point. Binding Heal (especially) and Greater Heal are just a bonus. Serendipity: When you heal with Binding Heal or Flash Heal, the cast time of your next Greater Heal or Prayer of Healing spell is reduced by 4% per rank. Stacks up to 3 times. Lasts 20 seconds. With 3 stacks, this reduces the casting time of your Prayer of Healing by over a third. (36%) Mine are about 1.7 seconds, and I have less than 450 haste. While no longer glitched to allow 2 ProH casts, it’s still a huge benefit in fights like Freya and Deconstructor that involve predictable raid damage. With Surge of Light, it’s typical that your next Flash Heal will be instant to aid in re-stacking this. Do not skip this talent. Empowered Renew: Your Renew spell gains an additional 5% per rank of your bonus healing effects, and your Renew will instantly heal the target for 10% per rank of the total periodic effect. In addition to adding more to an instant cast spell without a cooldown (great for fights where you’re running a lot – Hodir and Thorim, anyone?) it gives Renew a front-end instant heal like a Druid’s Rejuvenation. With Circle of Healing on a 6-second CD, this gives you a great option for a single player who needs a heal NOW. For you Holy PvPers, this is another heal that can’t be kicked. If you’re in this far anyway, take it along with Circle of Healing. Circle of Healing: Heals up to 5 friendly party or raid members within 15 yards of the target for 958 to 1058. 6 second cooldown. The spell that changed the face of Holy Priesting. Still a powerhouse, even without being spamable – the range is increased by Holy Reach, the healing output increased by Twin Disciplines and Divine Providence, and it will nearly always proc a Surge of Light, which will then help you stack Serendipity. Test of Faith: Increases healing by 4% per rank on friendly targets at or below 50% health. This talent is an extension of the use effect of the Crystal Spire of Karabor. Maxed out, and combined with 2 points in Blessed Resilience, it makes for some interesting effects on Flash Heal and Binding heal – at the expense of Greater Heal. If you don’t have all 5 points to spare, you’re better off taking the crit from Holy Specialization, as this is situationally applicable. Unless you’re PvPing, in which case you already have 3 points in Blessed Resilience, which makes this a no-brainer. Divine Providence: Increases the amount healed by Circle of Healing, Binding Heal, Holy Nova, Prayer of Healing, Divine Hymn, and Prayer of Mending by 4% per rank, and reduces the cooldown of your Prayer of Mending by 8% per rank. Circle of Healing, Binding Heal, Prayer of Healing, and Prayer of Mending are all in heavy rotation in Ulduar, and gain tremendous benefit from this talent. Max it out. Guardian Spirit: Calls upon a guardian spirit to watch over the friendly target. The spirit increases the healing received by the target by 40%, and also prevents the target from dying by sacrificing itself. This sacrifice terminates the effect, but heals the target of 50% of their maximum health. Lasts 10 seconds. 3 minute cooldown.